Join LifeShare of Oklahoma as they unveil the floral portraits of two Oklahomans that will be honored in this year’s national Rose Parade. Sandy Pekrul, of Enid, and Hance Henrie, of Owasso, will be representing Oklahoma in the Donate Life Rose Parade Float on New Year’s Day. LifeShare is the organ procurement organization in Oklahoma responsible for the recovery of organs and tissue for transplant purposes. Every year, LifeShare of Oklahoma helps sponsor the Donate Life Float in the Tournament of Roses Parade to raise awareness for organ, eye and tissue donation. As a sponsor, LifeShare is able to send one recipient to ride the float and one donor portrait to be honored on the float. This year, the Aidan Hooper Foundation and Promathera Biosciences are allowing LifeShare to send an additional donor portrait and recipient to be honored on the float. Join us as we unveil the Oklahomans who will be honored in floragraphs on the float. PHOTOS: There will be several opportunities for great photos and videos at the event. INTERVIEWS: The families of Sandy Pekrul, donor, and Hance Henrie, donor, will be available for interviews. 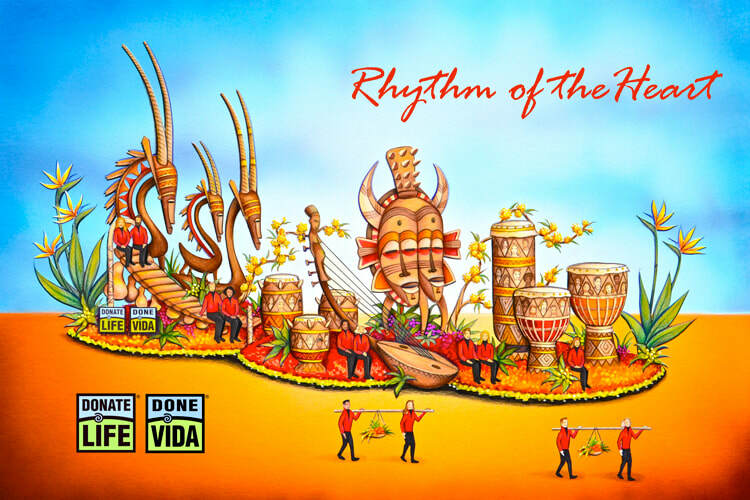 The 2019 Donate Life Rose Parade Float, Rhythym of the Heart, highlights the musical diversity and rhythms of Africa. Djembe drums from Senegal, along with a Kuba drum from the Congo will carefully integrate 44 floral portraits in their beautiful design, honoring the brave lives of deceased donors. Overlooking the floragraphs is a dramatic double Senufo mask from the Ivory Coast that gives thanks to ancestors and remembers those who have gone before. The double face suggests male, and female, past, and present generations, as well as the interconnectedness of all of those who have been touched by the power of donation. Twenty-six living donors or transplant recipients ride or walk beside the float, gathering around the drums, a giant marimba from Ghana, and an exotic kora from Burkina Faso. The kora and marimba play important parts in the passing down of stories of previous generations in song. Rising over the rear of the float are spectacular chiwara headdress from Mali; these stylized antelope headdresses are featured in dances that teach youth the value of community, in the same way the donation and transplantation community come together to share the importance of donation. ​Hance will be honored on the Donate Life Float as a tissue donor in a floragraph. A floragraph is a portrait of the donor, created with floral materials such as seeds, grains, spices, dried flowers and other organic materials. He is one of 44 donors to be featured on this year’s float. With the help of Hance’s outgoing and friendly personality, he was admired as a friend and also an inspiration of faith to all those around him. He was a proud Christian, and loved serving at his church and also helping on church missions. Hance had no barriers of friendship. Each summer, he worked at the local fruit stand and loved talking to customers of all ages. More than once, he proudly brought home secret family recipes from customers, eager to try each of them out. Hance’s favorite part of the summer was always science camp where he enjoyed leading and mentoring the young campers. Wanting to see the world, Hance attended college on a full NROTC scholarship and was focused on pursuing a degree in Geography. His grandfather had been in the military and Hance’s ultimate dream was to serve as a marine. The night before Hance was to return home to Oklahoma after finishing his first year of college, Hance’s life was tragically taken by the actions of a drunk driver. His family knew that he would have wished to help others through donation. Sandy will be honored on the Donate Life Float as an organ donor in a floragraph. A floragraph is a portrait of the donor, created with floral materials such as seeds, grains, spices, dried flowers and other organic materials. She is one of 44 donors to be featured on this year’s float. She enjoyed having people over and hosting parties. Sandy would often tell very bad jokes which everyone laughed at because of her contagious laugh. She was someone that everyone enjoyed being around and always welcomed friends and family with big, open arms. Sandy cherished every moment with her children, Adam and Angela, and was involved in every school and afterschool activity for them. She would sometimes bring her kids to work with her when she worked at a local TV station, allowing her kids to help host one of the shows. On their birthdays, Sandy would get so much joy out of surprising her kids with the house decorated in balloons and streamers. She wanted to be friends with her children, before a mom. She was protective of her kids and constantly wanted to know what was going on in their life and would often embarrass her kids in front of their friends. After an unexpected and tragic event, Sandy did not survive. She was a registered organ donor, had discussed donation with her family. Her generous spirit in life was able to continue to be generous to others through the lifesaving gift of organ donation. One of her lifesaving gifts went to Mike McClellin, float rider, who honors Sandy through his actions every day. Through Mike’s interactions with Sandy’s family, he is able to remind them of her generosity. LifeShare encourages everyone across the state to tune-in to watch the 129th Rose Parade on New Year’s Day.